The man Wallace Millsaps, known to thousands as Preacher Millsaps and whom his Appalachian relatives called “Wallus,” was born in the spring of 1909 in a log house built by Millsaps before him on Upper Jack's River in what is now the federally owned Cohutta Wilderness Preserve in Fannin County, near the Tennessee/ Georgia/ North Carolina line. The spot where the cabin stood is fertile bottom land situated as high above sea level as such land could be in Georgia and is sometimes occupied by a U.S. Forrest Ranger station until miscreant locals burn it down again. 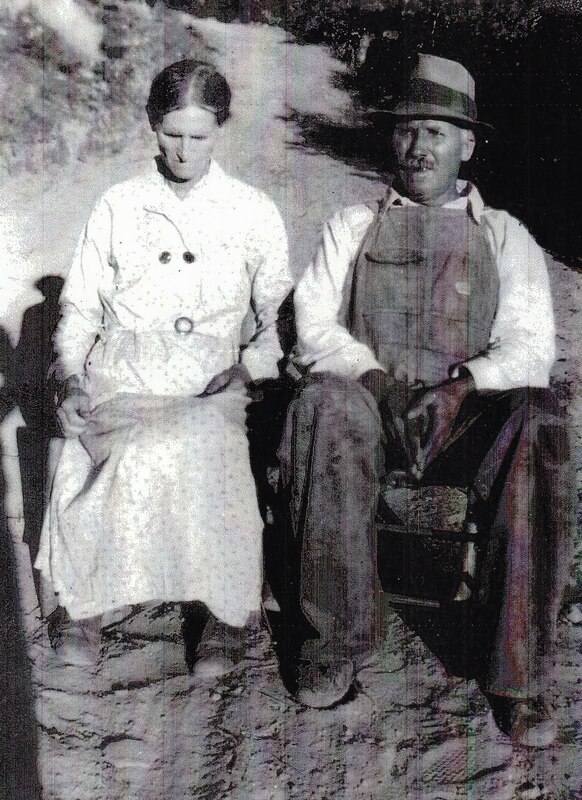 My father's parents Mount Aubrey and Lovey Jane Millsaps. His father, Mount Millsaps, and his mother, Lovey Jane, lived on a parcel of land that was part of a 4,000-acre tract of Cherokee Indian land “given” to a Thomas Millsaps by the State of Georgia for his service in the War of 1812. My father's great-grandmother was a member of that tribe. The entire Cohutta range was then owned by descendants of the men who had received the original land grants, most of whom were land rich and dirt poor, and almost all of whom lost their land to the government for inability to pay its taxes during the Great Depression. The boy Wallace's schooling ended at the sixth-grade level because the one-room church that doubled as a school only had six grades. To go to high school required a 15-mile trip to the hamlet of Epworth and you had to buy your books, both insurmountable obstacles. He kept attending the sixth grade for a couple of years after he'd graduated to pick up what learning he could – which is not as time consuming as it sounds because the young women the state sent to Jack's River to be schoolmarms never came back to face the mountain winters of Jack's River, once they went home at Christmas. As a boy, while much of the country was engaging in the excess of the Roaring Twenties, Wallace worked as a shepherd, tending sheep that foraged in the forest, living off of what he could kill and catch, away from home for days at a time, sleeping on the ground. He wore shoes only in winter. He was 16 years old before he saw a town bigger than a country store doubling as a U.S. Post Office – the town being the county seat of Blue Ridge 18 miles away, the barefoot teen-aged Wallace driving a mule, (who may have been named Doris, and who may have eaten oats) down the circular paths out of the mountains, pulling a wagon load of watermelons to be sold for whatever he could get. Once when he was eighteen he lay on his belly in the night. It was 1927. I can see him there in the forest on Jack's River, high in the Cohuttas. He is barefoot and his toes dig into the cool thick humus. It is summer, but the mountain breeze is cool and the air is sweet – rhododendron and laurel and sweet clear water running over smooth, slippery stone. At the edge of the clearing is the Lower Jack's River Meeting House. He is transfixed by the white painted cubicle, the only painted building for miles, and he listens to the Celtic gospel singing. It is revival and the one room building is packed. Children sit in the open windows and men mill about outside smoking, drinking homemade liquor. No one sees my father as he lies on the soft mossy earth. The church sits on a prize piece of flat land but Wallace lies in the woods, on the hillside above, his feet higher than his head, his arms folded under his chin. Another verse begins but he does not arise. A still small voice whispers, “Wallace, answer the call,” but he does not go, and after everyone so inclined gets a turn to testify or pray aloud, (though he hears his mother beseeching the Lord to save her son Wallace, a sinner,) the service ends and he joins his mother walking home. Wallace is “under conviction,” and he is scared to answer the call and scared not to. He did not arise, he often told people later, because he knew that answering the call did not mean, for him, merely entering his name in the Lamb's Book of Life and going back to the farm. His days of roaming barefoot through the hills, herding sheep by day, drinking corn liquor and whittling by night would be over. For he knew that, if he went to the mourner's bench and prayed with his mama, he would have to preach, and that scared him. He did not want to preach because he would have to tell the truth. It would be hard, he was uneducated and people would laugh at him. But of course we know Preacher Millsaps answered the call. Whether people laughed at him, I don't know. He began as an ignorant, ranting, hellfire-and-brimstone mountain preacher – the only kind he'd ever seen – and went on the educate himself, reading the Bible, of course, but also John Bunyan, the Jewish historian Josephus and daily newspapers. He was particularly fond of the legendary Atlanta Constitution Editor, Ralph McGill. He soon aligned himself with the Southern Baptist Convention, a relatively progressive group at the time compared to the independent mountain churches. He attended Mercer University Extension classes and obtained some kind of degree of which he was very proud. He became friends with many of its leaders. I am named after a Dr. Ellis Fuller, one of those leaders, and by the time I came along, his sermons relied more on humor and intelligent discourse than volume. In the 1960's, I remember the Governor of Georgia eating at our house and speaking at our church. Preacher Millsaps baptized over a thousand individuals. I have heard it said that he was one of the first mountain preachers to make a living from preaching alone – most worked at a regular job and preached on Sundays – pastoring five and six “part-time” churches at a time during the Great Depression, supporting a wife and what come to be four daughters by the second World War. But he always farmed. I grew up watching him behead chickens and pluck them – and they do run around like a chicken with its head cut off – helping butcher hogs of which we usually keep one fattening behind the house, walking behind him as he and someone's mule laid out rows in what was always a vast vegetable garden of mostly corn and beans.